Fallow creates bespoke, unique items that combine handwritten calligraphy, graphic design and an exceptional finish to ensure your event is as beautiful as you want it to be. Every element is carefully considered. We love to create keepsakes, memories and something for you and your guests to treasure forever. We offer a one-to-one Skype consultation with all clients so that the calligraphy, paper and inks can be matched to your theme or colour scheme. Our relationships with specialist printers mean that we can add beautiful print finishing such as letterpress, metallic foiling, or embossing to the design, adding that extra finishing touch. We can also write calligraphy on a wide variety of objects such as leaves, pebbles, glass tiles, mirrors and wood panels. Have an idea? Get in touch to discuss how we can make it happen! Visit our latest work section to see our previous work or get in touch to discuss a bespoke project. We’d love to hear from you. In the summer of 2014, Emma started running Fallow full time. Armed with plenty of ideas, and those blank notebooks to write them in, she started creating luxury products for many wonderful brides and event planners both in her local Cardiff and internationally. And now, whilst still specialising in weddings and events, she has also created custom calligraphy for many corporate clients to use on their products, branding and at their launch events. Fallow is graphic designer and calligrapher Emma Tickner, a lover of stationery, and a collector of beautiful notebooks that are too pretty to write in. She originally set up Fallow as a passion project to indulge her love of paper products and hand lettering whilst working full time as a graphic designer. Emma is Design Director at Fallow. She studied Graphic Design at the University of South Wales, graduating in 2006, and proceeded to work at various south Wales design agencies creating work for a variety of clients. 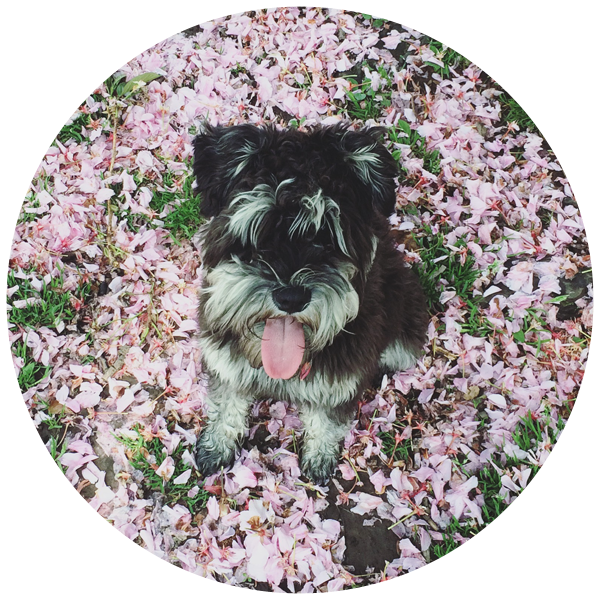 When Emma puts her pen down, she can be found wandering the welsh countryside with her Miniature Schnauzer Lola, buying anything colourful or beautifully made, and eating pizza. You’ll usually find her sat at her desk, with a coffee, Lola snoozing at her feet. Lola spends her day snuggled up under Emma’s desk, making sure that the day runs smoothly and meal times are never forgotten. When not snoozing or eating, Lola loves to chase tennis balls and bark at the delivery man.